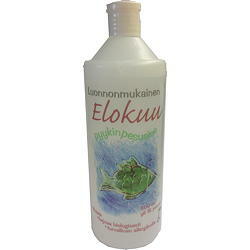 The fresh and ecological Elokuu laundry liquid cleans laundry soiled in daily life and is suited for both machine and hand wash. This product contains no bleach and is thus best suited for coloured laundry but can also be used for lightly soiled whites. For all coloured laundry and outdoor clothing. Doesn't include strong chemicals that would diminish water resistant finishes. Use 30 to 90 °C washing temperature as instructed by the clothing manufacturer. Only 9 bottles left in stock, after the stock is empty this product is not available. Only available from our store at Oulu, Finland. Can't be shipped. Only -94.6 litre left in stock, after the stock is empty only available from our store at oulu, finland. can't be shipped.